Shogaku Shunryu Suzuki-roshi (1904-1971) was a direct spiritual descendant of the great 13th century Zen master Dogen. Suzuki-roshi was a Japanese Zen priest belonging to the Soto lineage who came to San Francisco in 1959 at the age of 57. Already a highly respected Zen master in Japan, he was impressed by the seriousness and quality of "beginner's mind" among Americans he met who were interested in Zen, and he decided to settle here. He founded San Francisco Zen Center and Tassajara (the first Zen training center outside of Asia). This movement began many other affiliated Zen centers in America. 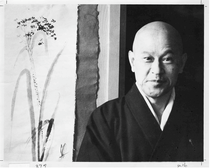 Jakusho Kwong-roshi began studying Zen with Shunryu Suzuki-roshi in 1959. He received ordination in 1970 and founded Sonoma Mountain Zen Center in 1973 as his commemoration to his teacher. Kwong-roshi completed Dharma transmission in 1978, authorizing him as Dharma successor to Suzuki-roshi's lineage. Kwong-roshi travels annually to the Southwest, Iceland and Poland to lead intensive meditation periods for affiliate sitting groups. He teaches ordinary Zen in everyday life as nothing special but the aliveness we bring to each moment.